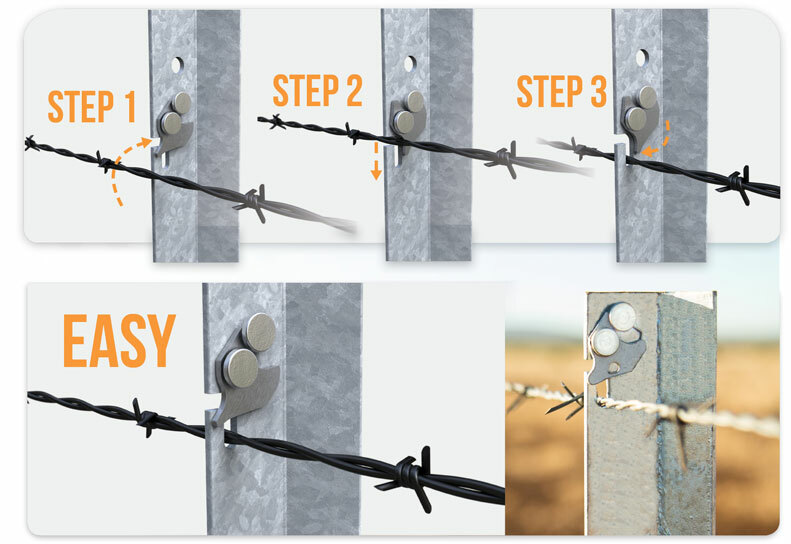 The Original Australian Clip Post, the Clipex® fence post is the fastest, most durable fence post on the market. With multiple patented features and award-winning design the Clipex® fence post has set the standard for all fence posts on the market. Don’t waste your time tying of wire to fence posts. Clip your wire into the posts with Clipex. Competitions at field days consistently show that it’s 12 times faster to clip-in compared to tying off tie wire. Get your fence up quicker and spend more time fishing with your kids. Unless they’re grounded. Then just put up some more fences instead. If you think bending over for 10 seconds to tie your shoe lace is uncomfortable, imagine having to stay bent down for 1hr and 4 minutes! That’s what it takes to tie off a bottom plain wire per km of a standard fence, no wonder your back’s sore. With Clipex, it will take just 5 minutes and 25 seconds to clip your wires in! Don’t be fooled, saving 50% on materials doesn’t add up if you have to replace the fence twice as often. You’ll spend twice the labour on an inferior fence! A Clipex fence saves labour, maintenance and material costs (no tie wire). It’s also one of the toughest available, so instead of having to replace it down the track, you can buy that new fishing boat instead. If you think bending over for 10 seconds to tie your shoe lace is uncomfortable, imagine having to stay bent down for 1hr and 4 minutes! That’s what it takes to tie off a bottom plain wire per km of standard fence. No wonder your back’s sore. With Clipex, it’d take just 5 minutes and 25 seconds! We have a few differant post designs, tailor made to suit differant wire types. There are several types of exclusion posts. There are different clip options, however they have their similarities. Innovative, time-saving, extra strong and durable, Clipex® standard posts started the fencing revolution. Clipex Beefy™ posts are incredibly strong with a huge surface area. The unique design of the beefy post enables it to outperform all other fence posts.